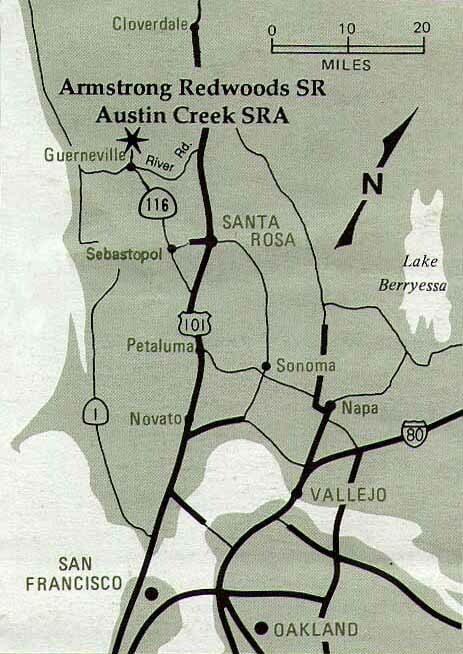 Hwy 101 to north Santa Rosa. Exit #494 River Road to Guerneville, 15 miles. At the second stop light in Guerneville, turn right to Armstrong Woods State Park, 3 miles. Stable is one mile inside the State Park. Follow "Horses for Hire" sign (left fork), 1/2 mile. Turn right by Armstrong Tree. With reservations, drive to corrals 1/2 mile down gravel road past "Authorized Vehicles Only" & "Locked Gate Ahead" signs. Off-season the horses are moved home, the gate is locked and road closed... except to riders who make reservations for horses to be brought into the park for their trail ride. All rides reserved by phone conversation only.